Wow....So, I would imagine no Summer at all was experienced that year. Do you have info on how that Winter turned out? Of note, when discussing 1917-18, much of the cooler summer was explained by volcanism if I'm not mistaken. @Niko, the winter of 1917-18 bore a large resemblance to 2000 or 2013 in my opinion. One of the reasons that 1917-18 gets my attention is reading the descriptions of SST and weather patterns over the Bering Sea during that era. For reference Google "The 'Old-fashioned' Winter of 1917-18". Also of note, I believe the fact that they called it old-fashioned (in its own era) also leads to believe that there was an oddly long era of warm winters with maybe 3-4 brutally cold ones interspersed over a near 30 year period there. Largely different from what folks would really believe based on today's data. I did a little research on January 1917. First off 1917 was much colder that average and the year is the coldest mean for the whole year at GRR with a mean of 44.6° Now for January 1918 I do not know how much snow Marshall or Jackson received but according to the official records at Grand Rapids and other locations the snows in early mid-January 1918 came is two storms one on January 6th and 7th and then the one on January 11th and 12th Here are some totals from the two storms Grand Rapids Jan 6th 11” Jan 7th 2” Jan 12th 10” Jan 13th 2” total on the ground 22” Lansing Jan 6th 5” Jan 7th 1.5” Jan 11th 2” Jan 12th 4.8” total on the ground 15” Detroit Jan 6th 2” Jan 11th 1.3” Jan 12th 3.7” no report of total on the ground. Saginaw Jan 6th 5.8” Jan 11th 6.8” Jan 12 1.2” total on the ground 16” All Michigan locations reported lows on the 12th of -14° or -15° Fort Wane Jan 1st (yes the 1st) 5.7” Jan 7th 4.0” Jan 11th 4.2” total on the ground 19” coldest low on the 12th -24° Chicago Jan 6th 14.4” Jan 7th 0.5” Jan 11th 5.9” Jan 12th 4.0” total on the ground 25” coldest low -14° January 1918 was a cold and snowy month in the great lakes area. At Grand Rapids the mean for the month was 18.4° (-11.9°) and 45” of snow was reported. I hope this gives you a good idea as to how the winter of 1917/18 turned out but as I said the summer fall leading into it were much different than this year. “2015 marks the 100th anniversary of the May 22, 1915 explosive volcanic eruption of Lassen Peak in northern California. The eruption forever altered an already dynamic landscape and led to the creation of a national park, which serves as a place of discovery for curious visitors, and a living laboratory for many scientific disciplines. A century after the Lassen eruptions, work by U.S. Geological Survey scientists — in cooperation with the National Park Service — is shedding new light on these events. USGS and Lassen Volcanic National Park are commemorating the centennial with several events in 2015. For some reason, volcanoes affect the atmosphere in terms of precipitation and temps. Perhaps, the small ash particles and the aerosol clouds in the air help to cool down the temps. "Yes there was some volcanic activity before 1917, not sure how much of a inpact it had on the weather of 1917/18 here is some info on that"
Well, we often cite Mount Saint Helen as a contributor to the brutal winter of 81-82, so there may be some connection with an eruption in our part of the globe. First I've heard of this 1915 volcano tbh. "In a prior post, Hoosier posted stats for warm La Nina Novembers and what the winters ended up doing. For the research for our local winter outlook at NWS Chicago, I did something similar. First I grouped all winters of the 1950-2017 ONI from the CPC page into warmest 22, middle 23 and coldest 22 at Chicago. Then I grouped the Niña episodes of those terciles into warm (9), near normal (6) and cold (6). Here are the November h5 composites, November climate division temperature anomalies, and subsequent DJF h5 composite anomalies. From these graphics, it appears there will be utility in how the mid/upper pattern sets up in November to potentially give clues to the winter pattern. If a big northeast Pacific/AK vortex sets up, that could increase odds for warmer to well above normal winter, and perhaps within range of normal to below if sustained Aleutian (-WPO) or -EPO ridging sets up." An avg Nov turns out ok as well, but we really want a cold Nov to elevate our expectations of something special going forward. the central and eastern Pacific Ocean. Nice, as long as the cold anomalies don't over-run the surface too much, we'll get a mostly neutral scenario this winter I feel. NMME shows borderline Nina/Nada, going only slightly more negative, nothing drastic. Just enough to get the jet (moisture) response we desire..
Actually, I see the NMME was dated the 9th, so here's CPC's from their weekly released today, the 30th. Region 3.4 riding the Nada/Nina line! So the La Niña is east based yet we continue to see this eastern ridge from hell keep showing up. SE ridge is proto-typical Nina pattern. There's a good chance it get's beat-down as we head into and thru winter, but until then it will rear it's head whenever it's able. Also, it's not an official Nina, and even if it was, there's a correlated lag period (not sure what that is tbh) between SST's and atmospheric response, similar to that seen during a SWE. Tom or anyone more knowledgeable can chime in if I'm missing the mark with any of this.. While not yet an official Nina by longevity, we can clearly see that whatever level it reaches (or doesn't) that it would be East-based, not central. That alone is a good thing per analogs for our upcoming winter. It's also known that the winter starts off on the warm side with Dec being chilly in the north only, not further south, as I mentioned. The cold begins to intensify after the winter solstice so it's not typically a front-loaded season at all. Certainly with this, and a -QBO plus a relatively calm solar situation, there's a LOT of signals for cold after we get thru autumn. Not that it's really hot outside right now.. Saw a blurb yesterday (BAM?) that the Nina has recently relaxed in R1.2 to where it's almost averaging out as neutral, which I'm fine with personally. Yes. 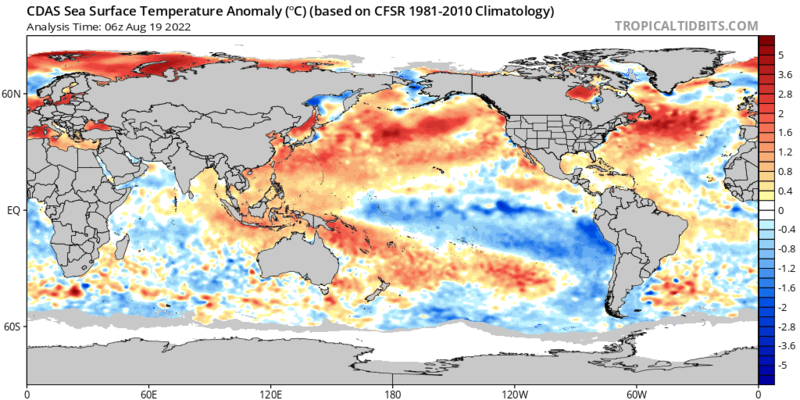 If the Nina will gradually drift West over the next 3 months it will be absolutely perfect. My call was ENSO 3.4 region to bottom out around -1.2 during the heart of winter. Latest Euro run more bullish with the Nina...which has been the trend over the last several months. It'll be close, but a moderate Nina is probably not happening, however, reaching moderate intensity during the DFM period is on the table. Climate models are predicting a similar strength ENSO event for this winter. Ironically, look at how cold Nov '95 was and compare it to this year thus far. Difference being the stunning temp gradient this year. A better scenario imho. This is one of the best SST maps I've honestly ever seen from where I stand. I have never seen more features that argue for a lengthy cold winter in my life. ENSO 3.4 region may have peaked at a low very close to my call of -1.2C which happened earlier this month. Other than rollercoaster temps, are we going to see the much anticipated moisture facet of a Nina tho? Sure would be nice..
That's a very solid La Nina. The 3.4 region is now at -1.5.